The acoustic quality of the indoor and outdoor environment is connected to ecosystems and models of development. Like the other elements that characterize habitat, good and bad sounds influence the quality of life of the communities that inhabit it. 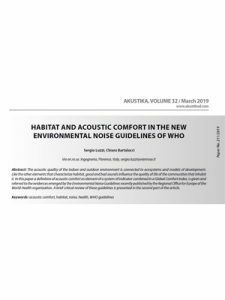 In this paper a definition of acoustic comfort as element of a system of indicator combined in a Global Comfort Index, is given and referred to the evidences emerged by the Environmental Noise Guidelines recently published by the Regional Office for Europe of the World Health organization. A brief critical review of these guidelines is presented in the second part of the article.